Memorial Day started off as a somber day of remembrance; a day when Americans went to cemeteries and placed flags or flowers on the graves of our war dead. It was a day to remember ancestors, family members, and loved ones who gave the ultimate sacrifice. But now, too many people “celebrate” the day without more than a casual thought to the purpose and meaning of the day. How do we honor the 1.8 million that gave their life for America since 1775? How do we thank them for their sacrifice? We believe Memorial Day is one day to remember. This weekend I am going to do something different. I am going to buy some carnations each day and go to one of the nearby cemeteries and walk through the sections for soldiers. When I find a grave that has no flowers, I’ll leave one and say a prayer for the family of that person, who for some reason could not bring their soldier flowers. I will pray for our country and all who serve or have served. For their families, who also serve by losing precious days, weeks and months spent with their loved ones who are off serving, preserving peace and the freedom we have in this country. I’ll pray for the families who paid the ultimate price, who’s loved ones died, or were taken captive and never returned. I’ll pray for anyone who may still be held in captivity and thinks perhaps they are forgotten. I do NOT forget. I’ll say a prayer for every person on the Internet who takes a moment from their time to come to sites like yours and be reminded of what this holiday really means. And I’ll say a prayer of thanks and ask God’s richest blessings on you. Thank you again…. and God bless! 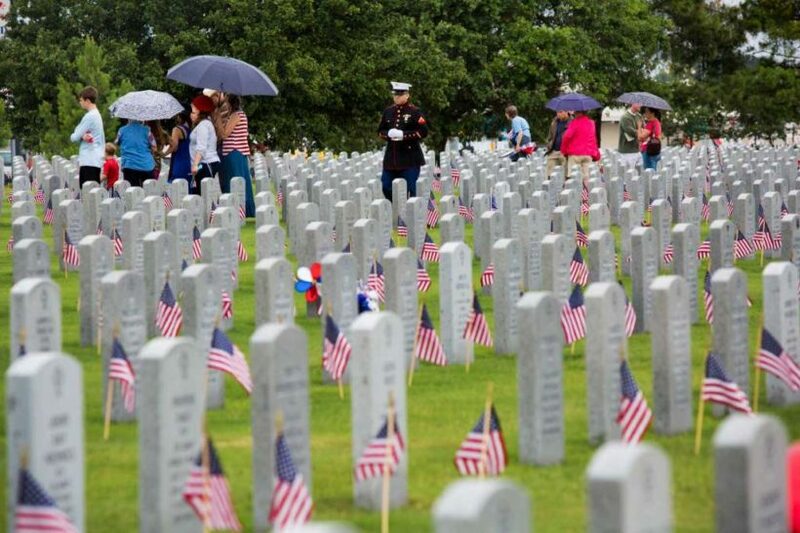 Families brave the rain and visit the graves of their U.S. serviceman and women on Memorial Day at the Houston National Cemetery, Monday, May 26, 2014, in Houston. In 1999 I laid flowers at the grave of a young U.S. fighter pilot who was KIA in my village in 1945. In the Netherlands I know of schools ‘adopting’ graves of Allied servicemen, keeping those graves in excellent condition ! Does anybody know of adopting graves in the U.S. by schools? Paul Patist Castricum, The Netherlands – Tue May 15, 2001. More schools in the U.S. could follow the lead of the Netherland schools. Let us take a few moments this Memorial Day to reflect on the meaning of the day, to observe the day and be mindful of the sacrifices of others before we go and enjoy the freedoms they bought for us. Reprinted from usmemorialday.org/observe.htm. For educational purposes only. Watch the National Memorial Day Concert on Sunday, May 27th on PBS. Originally called Decoration Day, from the early tradition of decorating graves with flowers, wreaths and flags, Memorial Day is a day for remembrance of those who have died in service to our country. Memorial Day was officially proclaimed on May 5, 1868 by General John Logan, national commander of the Grand Army of the Republic. Memorial Day was first observed on May 30, 1868 when a special ceremony was held at the Arlington National Cemetery where flowers were placed on the graves of Union and Confederate soldiers. Memorial Day was originally known as “Decoration Day.” The alternative name “Memorial Day” was first used in 1882. Moina Michael conceived of the idea to wear red poppies on Memorial day in honor of those who died serving the nation during war. She was the first to wear one, and sold poppies to her friends and co-workers with the money going to benefit servicemen in need. In 1921, her efforts resulted in the poppy being adopted as a symbol of remembrance for war veterans by the American Legion Auxiliary. Memorial Day is usually observed in the United States on the last Monday of May. Memorial Day was first enacted to honor Union soldiers of the American Civil War, but its scope was expanded after World War I to include all U.S. men and women who died while in the military service. The National Memorial Day Concert takes place on the west lawn of the United States Capitol and is broadcasted every year on PBS and NPR. Waterloo, NY was given an official recognition as the birthplace of Memorial Day on May 26, 1966, when President Lyndon B. Johnson signed a proclamation declaring the same.